so, it’s been 5 days since i handed in my final dissertation and left UBC Okanagan. it feels like a lifetime. after 6 solid weeks of preparation (not to mention the 4 years before that! ), d(efence)-day came and went. don’t get me wrong, i REALLY enjoyed my defence. The room was full of supportive faces, including fellow students, faculty, yogis, friends-along-the-way, and members of the Parkinson’s community. 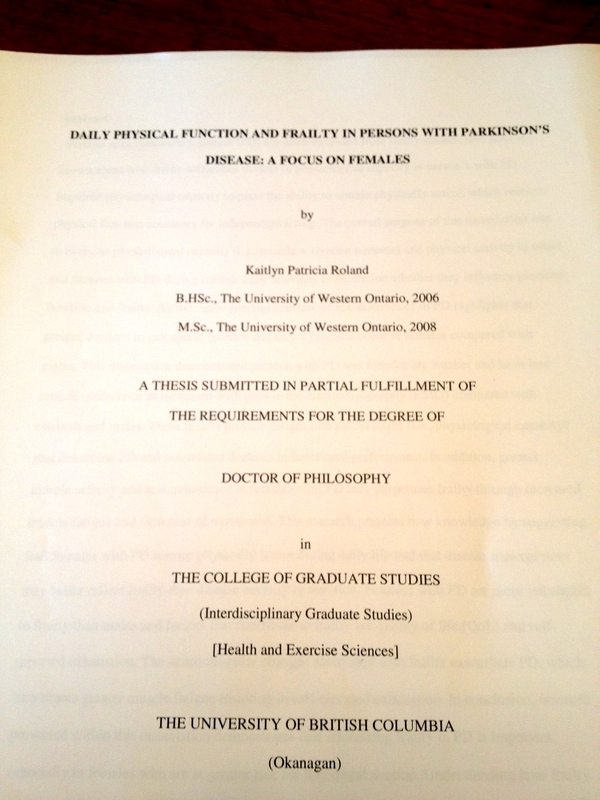 I had an amazingly diverse examination committee, including an anthropologist, biologist, gerontologist, and 3 exercise physiologists (motor control, neuromuscular and aging/physical activity) – which resulting in some rich insights and great perspectives on my work! it’s a pretty great feeling to have the attention of a room for a few hours to really explain what you’ve dedicated yourself to for the past 4 years and why it is important. Immediately after my defence I was asked how I felt, and to be honest, not too different. The rollercoaster ride of relief I was expecting, wasn’t there. Rather, I took in a deeper breath and let my shoulders relax. The next morning, I woke up with a little less urgency. The morning after that, with a little less pressure/weight on my shoulders. As my (now, past?) supervisor says, ‘the PhD defence is not the end, but only the beginning’. I can say that i’m looking forward to beginning a new chapter and seeing what it has to offer. Sincere gratitude to my supervisors Dr.’s Gareth R. Jones and Jennifer M. Jakobi, who not only supported my academic career, but also included me as part of their family. To Gareth, who motivates me with his enthusiasm to empower older adults to remain active, and to Jenn, who inspires with me her passion for research and her students. I would like to thank the other members of my committee for their guidance and support; Dr.’s Joan Botorff and Gord Binsted. Especially, Dr. Colin Powell, whose expertise in Parkinson’s disease and frailty has been invaluable to my doctoral experience. I would like to acknowledge the faculty and staff at the School of Health and Exercise Sciences and School of Nursing, who provided mentorship and urged me to approach problems in innovative ways. Also, thank you to the University of British Columbia, Interior Health Authority, the British Columbia Network for Aging Research, the Government of British Columbia, the Canadian Institutes for Health Research, and Parkinson Society Canada for their financial support of my research and graduate student experiences. A huge thank you to my friends and fellow students at UBCO; I appreciated your words of advice and the numerous experiences we shared over coffee (or pints!). I am grateful to the yoga community who helped me stay grounded and balanced throughout this experience. To my family, especially Dad, Mom, Dave, and Flo; your love and support has meant so much throughout my academic years. Finally, I give my deepest appreciation to Darc; for your boundless love, encouragement and the sacrifices you made for me. To my grandparents, who have helped me see the wisdom and strength that comes with age.